Taking care of your move, organizing your office space or planning an event for your family wouldn't happen if we didn't create our own family first. Our team is a crew of hard-working, up-at-dawn, loving, diligent organizers. We're people first. We have kids, pets, histories, our own stories and lives and we always try to bring that love, empathy and sincerity to each client. Our goal is to inspire you to tell your friends, "hiring them was one of the best decisions we made." 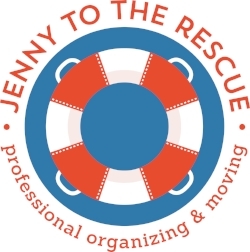 What makes Jenny To The Rescue better than other movers, organizers and planners? "J-E-N-N-Y ! Other companies may provide similar services, but no one has Jenny - the magic, secret weapon of success. Before I worked with Jenny, I was a client, as was my daughter and her father. I was absolutely astonished at her unbelievable work ethic and organizational skills." "... everything came through without the slightest damage--even really fragile stuff. If you ever need us to reassure potential customers that they are in good hands, we'd be happy to talk to them!